You are here: Home / College Admissions / Is This Score Enough? 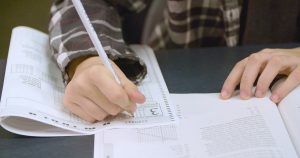 College applications are underway and many students across the country are trying for that last ACT or SAT score increase, hoping it will gain them a berth to a highly selective college. The pressure builds as families stake their hopes on trying to get past the malicious admissions officers who would keep their child out because of a stumble on test day. It can begin to feel like an “us against them” war. However, let me give you a new lens with which to view test scores. It is true that each college has a range of standardized test scores that are more likely to gain entry to their institution. But there is a very good reason for that. Test scores are a gauge that admissions officers use for seeing what potential students can realistically handle. Do they have the background to deal with the rigor at that particular college? Does their mind move fluidly enough to grasp material at the rapid-fire pace they will encounter? Kids aren’t being punished for a lesser score, but colleges know from long experience that standardized test scores, however imperfect, are good predictors of students’ abilities. They want your child to be successful because no one wins when kids get accepted at a school where they are overwhelmed. Poor grades and disillusionment are a best case scenario when this happens. Worst case is depression, escapism into drugs and alcohol, and even suicide. Be grateful for admissions officers who care enough about your child to make sure they are ready to thrive before they will accept them. There are over 3,000 institutions of higher learning in this country. There is a good fit out there for your child and their best test score! There are also other questions you need to be asking as a parent, but they are not what you would expect.